Losing your hair can be a dispiriting development in your life—especially when it seems so arbitrary. The top of your head may be completely bald, while your friends and coworkers still enjoy a thick head of hair. You may have lost the genetic lottery, but you don’t have to accept the results. Dr. Houser and the staff at Cosmetic & Plastic Surgery of Columbus are proud to offer both prescription options and a modern technological advancement called the ARTAS® Robotic Procedure to help you with your hair loss needs. 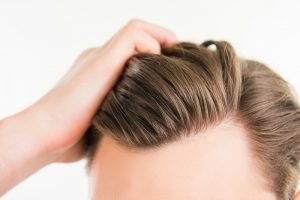 During your consultation, Dr. Houser will examine your hair loss and discuss with you whether finasteride therapy, Minoxidil medication, or Platelet Rich Plasma treatment may be the right course of action in maintain the hair that you currently have. For those who seek a minimally invasive all-natural treatment, the revolutionary ALMI™ Procedure may be the solution. ALMI™ Hair offers patients a unique opportunity to regenerate hair follicles without surgery. By injecting adipose (fat) cells and platelet concentrates directly into areas of sparseness, bald spots, or receding hairlines, patients can achieve restoration of hair follicles, regrowth, and increased thickness of hair that improves after each growth cycle. This innovative treatment is performed under local anesthetic and offers patients a low-pain, minimally invasive procedure that delivers incredible results. To discuss the many options you have for a fuller head of hair, be sure to schedule a consultation with Dr. Houser who will guide you through the process of choosing appropriate treatments for your best hair. If you’re looking to regrow your hair, the ARTAS Robotic Procedure may be the best step forward to helping you regain your confidence. Developed with leading hair transplant physicians and researchers, The ARTAS Robotic Procedure was created to eliminate the guesswork and fatigue associated with manual handheld FUE methods. This means far less scarring, fewer complications, and shorter downtime than the existing invasive surgical techniques. And unlike older transplant methods, no stitches are required, rendering your procedure nearly undetectable. The system involves the ARTAS Hair Studio—a 3D photograph-based simulation of your potential procedure results. During your consultation, Dr. Houser will work to design your personalized cosmetic hair pattern and illustrate different options, showing you various graft counts and hair distribution, using your direct input. Being able to view these different options enables you to preview your potential outcome and see what you could look like with your new, permanently growing hair. You may also include your spouse or partner to help. With the ARTAS Hair Studio, you no longer have to use your imagination and hope for the best. This process may help to build your confidence by presenting you with an achievable, desirable aesthetic outcome. Men who decide to have a hair transplant benefit from understanding what is realistic and reasonable given their degree of thinning or baldness, facial structure, age and desired result. Using the ARTAS Hair Studio, Dr. Houser can apply his expertise and medical judgment to advise you and assist you in making the best decision. Once you’ve completed a plan, the same ARTAS Hair Studio technology is used to create your robotic recipient site-making treatment design, which is then transferred to the ARTAS Robotic System for implementation. The physician-assisted ARTAS Robotic System will then use advanced algorithms to select the best hairs for harvesting, while preserving the natural look of your donor area. During the initial stage, hair is selectively harvested with robotic precision providing consistent graft dissection. Advanced robotics provide speed and harvesting accuracy unavailable with manual handheld techniques. Most ARTAS Robotic Procedures start in the morning and end in the afternoon. During the ARTAS Robotic Procedure, you will be seated and the physician and clinical team will do everything they can to ensure your comfort. A local anesthetic will be used while you remain awake and alert during the procedure. Most patients describe their experience as virtually pain-free. There will be time for breaks during the procedure, so you should expect to have a pleasant experience throughout the process. You’ll be able to return home immediately after the procedure. Your clinician will instruct you on how to care for your newly transplanted hair. Most people will sleep comfortably without pain immediately post-procedure and will return to their regular activities in a few days. Your newly transplanted hair, like the rest of your hair, grows steadily over time. After a few months, you will begin to see new hair growth. After six months, you will start to notice significant growth. Your hair will continue to grow in the treated areas over time. You will be able to take care of your newly transplanted, permanent hair as you normally would! If you’re concerned about balding and would like to learn more the ARTAS Robotic Procedure, call Dr. Houser at Cosmetic & Plastic Surgery of Columbus today to schedule a consultation.